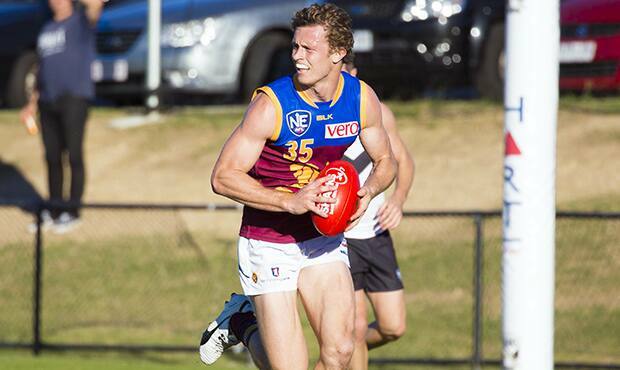 Reserves Coach Shane Woewodin gives his appraisal of each of the listed Lions who played against Southport on Sunday. “The boys started really well on the day. Our intensity in and around the contest was fantastic and our ability to put pressure on Southport around the ball was very good. “We moved the ball pretty well going forward. Unfortunately for the first quarter and a half we had ample opportunity inside 50, particularly set shots. I think we had 2.5 at quarter time then missed four shots on goal. Pretty simple ones in that first quarter. We didn’t cash in and take care of our opportunities when they presented themselves. Going into the second term we kicked four points in a row to be at one stage 2.9 to their 8 goal second term. Sammy started well. He looked pretty strong early. He had a couple of contests particularly in the second half where he let the ball through. But other than that it was certainly a pretty solid display he was certainly one of our best players on the weekend. Not the game we required from the skipper on the weekend. After a really good few weeks from Jackson, it was dissapointing to see him do a few undisciplined things. He gave away two free kicks in the second term which Southport were able to kick some goals from. Off the back of that, Jackson’s been suspended for a week so we look forward to him returning and repaying faith to his teammates. Unfortunately for Josh McGuinness he’s sustained, I think, his fourth hamstring for the year which is really unfortunate for Josh. He had missed about 3 or 4 weeks with the last one. It was his first game back returning and late in the first quarter he was tackled and felt a niggle in his hamstring. He didn’t return for the rest of the day. Unfortunately he is back in rehab. Hoping for a 27-day return for the last game against the Giants. Played off half-back. He was given a job to do on one of their more dangerous players. We saw a couple of good things with his intensity again that was required and his ability to get back and defend. He’s still learning the craft playing as a half back. We’ll look to continue to develop in this area just so he’s got another string to his bow. A quieter game from Billy. He played as an inside mid with the ability to push deep forward when resting. He didn’t win a lot of ball – did a couple of good things around stoppage but a quiet one for Billy. Started really well and looked really dangerous for us. We played him more as a mid, resting forward – similar to Billy and Ryan Lester. He had three shots on goal early but unfortunately mid-way through the second he sustained a knee injury. He did his meniscus and had surgery yesterday to repair that and he is now out for the season. Closey worked really hard on the day. He had a really good opponent, their best defender in Sully played on Michael. He didn’t reap the reward for what he did. They looked to play a spare in front of Michael a lot of the time, but he worked through it. He was really directional and instructional with his voice. Jono was better than the week before – worked a little bit harder, got involved in more contests. He played as a key forward alongside Michael Close, took a couple of marks and missed a couple of crucial set-shots on goal in the second term which didn’t help us. It’s a work in progress for our key forwards. Started as a key forward changing with Archie in the ruck. He worked pretty hard. Got on the spread a bit, looking to be involved more around the ground. His ruck work was solid again. Clayto played as an inside mid for us. He’s continuing to work on his contested footy part of his game. He wasn’t as impactful as what he was the previous week against GWS in terms of his numbers. That said it was a pretty quiet day for our mids – we’re hoping for them to bounce back. Again worked in tandem with Westy. He was in and around ruck and at times went forward. His follow up work was OK. Some timings around centre bounce need to get better this week, but his stoppage work was pretty good around the ground and he was able to give our boys first use when needed. His work-on is probably just to have more impact around the ground. Our best player on the day. He was given the players’ player award yesterday from his peers. He had a bit of the ball – gathered 25 touches for the day and kicked 2.2. There were times when he was resting forward. He could’ve had 4 (goals). He was certainly our most damaging player on the day and continued to drive his legs and work hard on his spread to win some uncontested ball in and around the ground as a midfielder. His work inside was terrific.